Spice makes its way to Berlin this summer. Gone are the days of bland (but necessary) wurst and brot and enter the new phase of expatriate flavour, spice and zing: Jamaican. Jerk. Chicken. 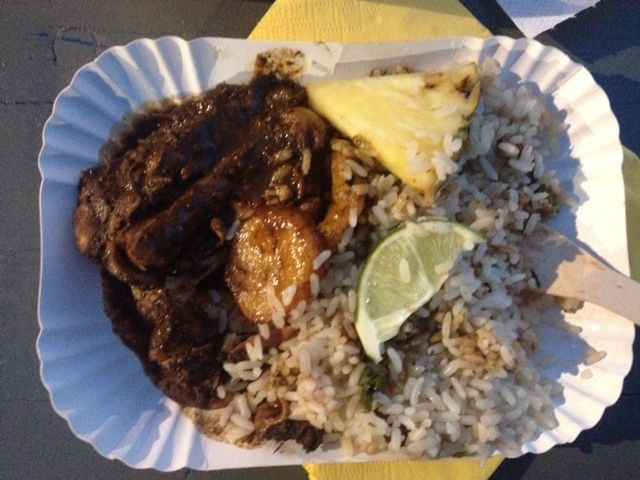 All over Berlin, Jamaican cuisine is popping up and Louise and Fred of Spice Spice Baby are doing just that. The spicy and delightful jerk chicken made fresh by Louise. With strong Caribbean flavours head chef Louise is taking jerk chicken to the next level with a deep and dense sauce accompanying the humble side of beans and rice. Served with pineapple and lime the jerk chicken is a burst of summer flavour with strong herbs and spices that taste of rum and chilli. The marinated chicken can be served with additional jerk sauce to meet your spice needs, personally the hotter the better! Louse has put together an amazing sauce that lasts, soaking perfectly into the flesh of the chicken, thanks to an overnight marinade, without compromising flavour on the outside skin. Spice Spice Baby can be found around town all summer, guests at Biteclub and Neue Heimat. Just follow the bright colours, smiling faces and the smell of smoking bbq chicken.